The tip of the 'four stories of stone' iceberg. This is not a contemporary cookie cutter house, built with kiln dried pine and vinyl siding. The weight of things in this house can be measured in tons. Tons that I am slowly shifting, tearing out, and moving, in incremental amounts. The massive chimney inside the house is no exception. It extends from the basement, up into the first floor where there is a fireplace, then through the second floor bedroom (taking up the equivalent space of a large closet), and into the attic. However, it doesn’t go through the roof. At some point, a new roof was put on. 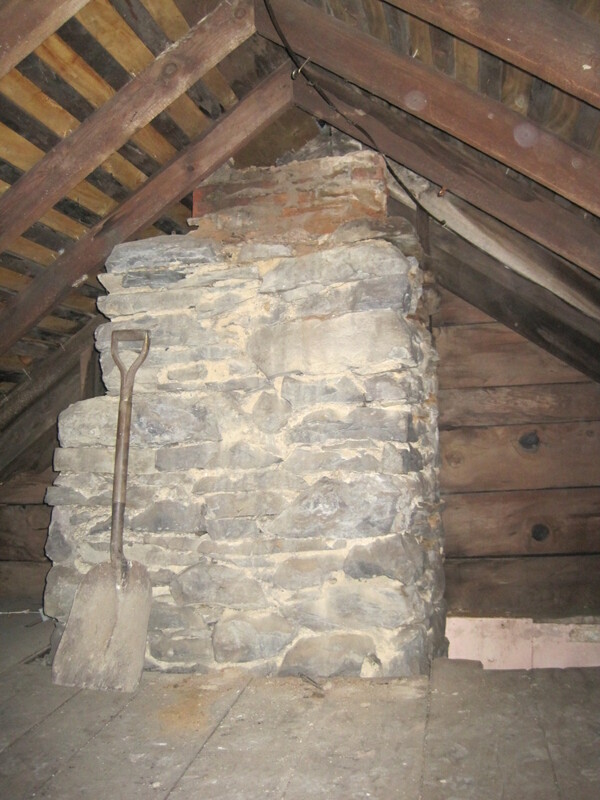 Perhaps because the fireplace was so old and would be too expensive to repair, the top was removed and roofed over. It is a shame that the chimney is not functional because the fireplace in the dining room certainly adds character. 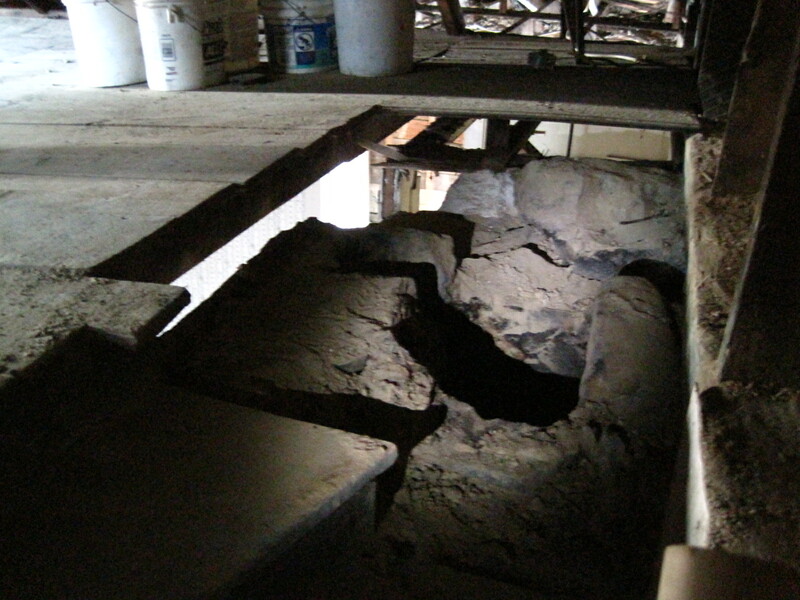 Scary view of chimney in basement. No amount of mortar and paint will clean this thing up! In the basement, the design of the chimney is quite strange (at least to my inexperienced and untrained eye). As you can see, it is not simply a column of stone down to the floor. It looks as though there may have been a wood stove in the basement at one point, with a hole for a stove-pipe. 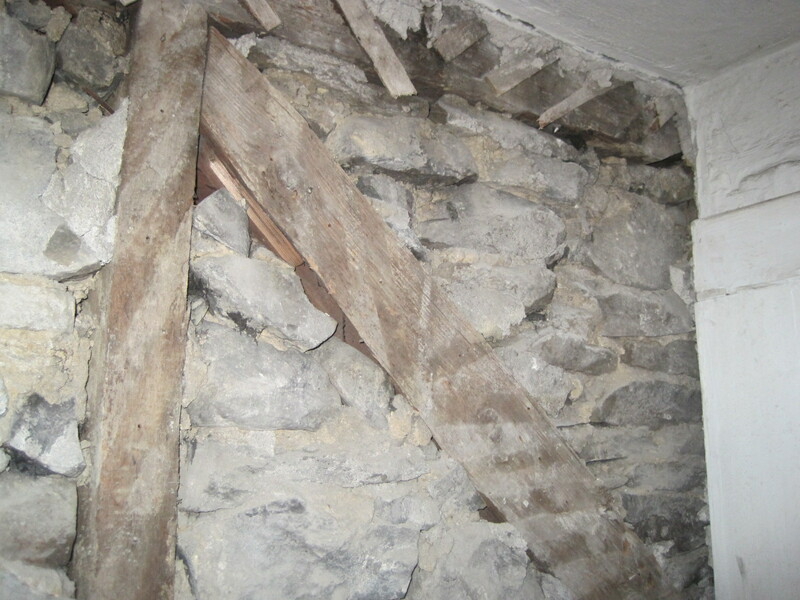 There are various beams and boards in the stonework. Some boards are supporting the hearth above in the dining room. 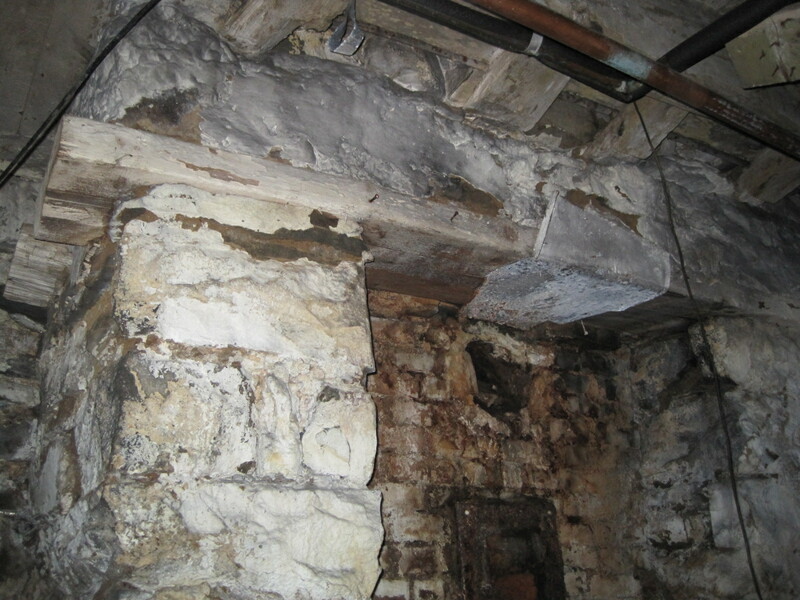 There are also beams running through the stonework. Some of these boards are rotten, and they are all very old. 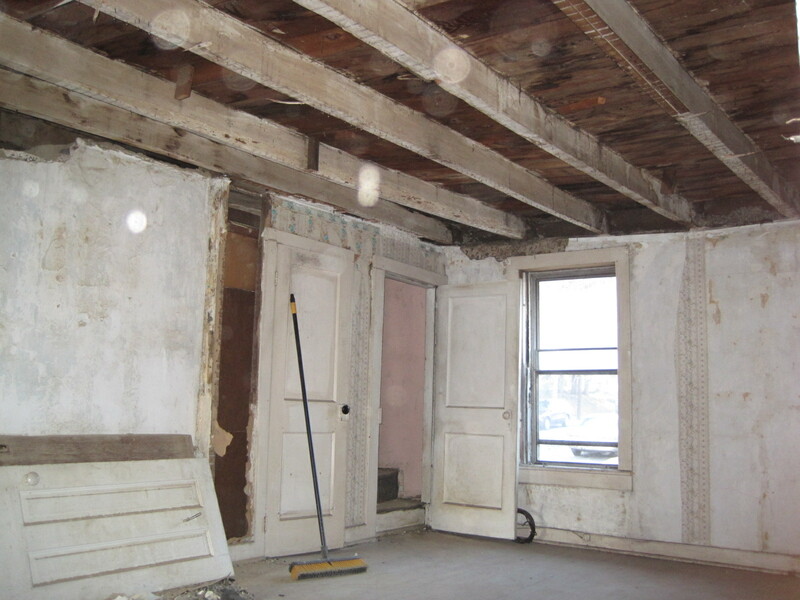 This is one area of the house that will be disconcerting to a prospective buyer, no matter how much renovation occurs above. The dining room fireplace, encased in a massive stone chimney. The rather absurd thought of removing the entire chimney was first suggested by Chuck Silfee, the builder and excavator who dug out the foundation around the rotten walls of the addition. Since he builds and remodels houses, he wanted to see what I had gotten myself into. It was during this initial tour of the house that he saw the chimney, and said matter-of-factly that I should remove it. What Chuck says shouldn’t be taken lightly (no matter how absurd it may sound at first). Massive 18 sq. ft. chimney, with doors leaning on it, taking up closet and window space in the bedroom. He owns and operates heavy equipment, such as excavators, bulldozers, and trucks of the size that boys at heart turn to watch drive past. He tears down and hauls away houses like this over the course of a long weekend. He also readily restores and builds houses, using every bit of brute strength, finesse, and craftsmanship that this house will require. He is not a big man, but still conveys the strength and determination of the equipment he uses. Tearing out the chimney, though, seemed like a crazy idea, even coming from Chuck. I realize that he works on a bigger scale than me, and has ready labor, but the idea still struck me as absurd. For me, working on a much smaller scale, the idea was unfathomable. Not to mention that I already have too much work on my hands. The rear of the house is collapsing because of rotten sills and studs, for goodness sake! The labor involved would be crazy, and where to put the stone? I don’t know why I even contemplate it. As absurd and unfathomable as the idea may be, however, it has taken hold in my imagination. I sometimes think that bashing my head against this huge chimney would benefit me much more than thinking of removing it. None-the-less, as I work on other things, my thoughts return to removal. If one does think about it, removal would enhance the basement (which is scary and cannot be remodeled like the rest of the house), the first floor dining room would become bigger and more functional, and the second floor bedroom would gain considerable wall space, allowing for a big closet and a window. Also, it would provide needed attic space and room for the job of putting in new bedroom ceiling joists (which is another absurd task that I will get to). This process of ruminating on whether to remove the chimney, and accentuating the positive, is also how I think I talked/thought myself into buying the house in the first place. How many projects are started due to an off-hand comment or joking challenge to one's manhood? I jokingly taunted some friends that instead of going for a run they should do real work – hauling stone down several flights of stairs and out into the yard. A combination of friendship, bravado, and insanity prompted them to accept the challenge. 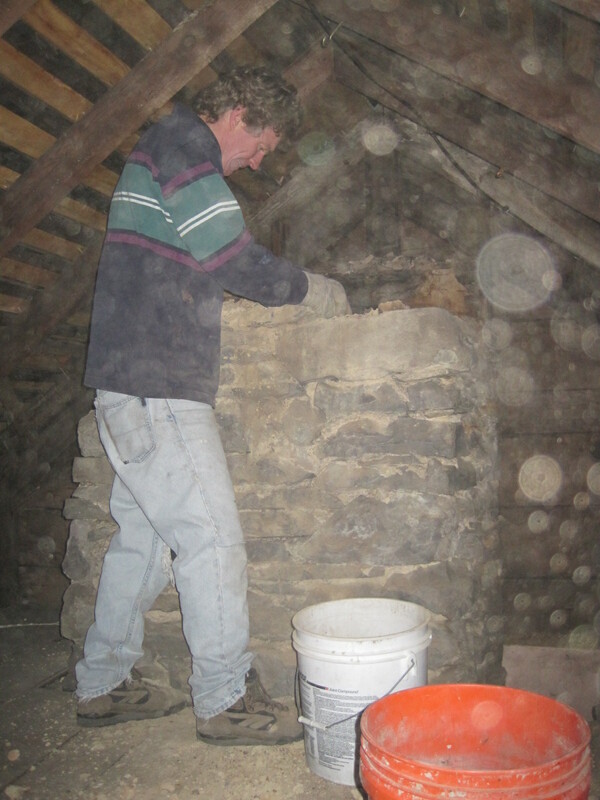 A brutal, and dust choking, three hours later, we managed to remove, by hauling buckets-full and throwing from the window, the attic portion of the chimney. Wow! I did not expect such a significant accomplishment. What started as a joke turned into some actual progress. This absurd project may be feasible after all. However, as motivating as the great start is, it is just that – a great start. The chimney gets progressively taller and wider on the two floors below, which is going to generate even more stone, and dust, and pain. I will also have to figure out what to do with all of this stone. Frankly, all we have done is use gravity to help us transfer the stone in the attic to the yard below. Tonight I put an advert in Craigslist for ‘Free Stone.’ Craigslist hasn’t failed me yet. Let’s see how long this takes! Chimney now just below attic floor (and bedroom below visible through gap). Does progress make it sane? Fearless help for a fearful job, seated where the chimney used to be. Removing the kitchen floor with a chainsaw, crowbar and sledgehammer. More debris too! Tearing out the kitchen floor seemed like a good idea. A couple of joists needed to be replaced, and it seemed to make sense that while I was at it, I might as well do the job right. 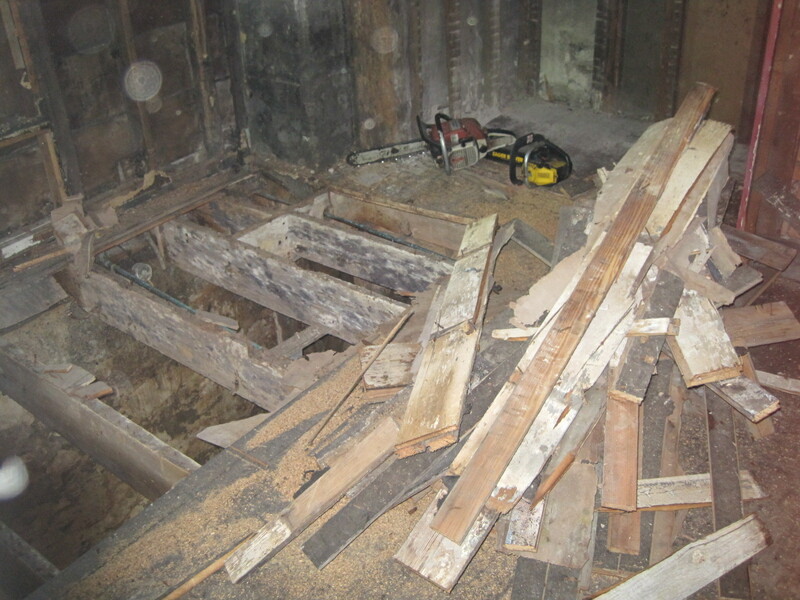 My first real decision – replace only two joists, or tear out and replace all the joists and the floor as well. Removing only the offending joists (cutting away the hundreds of nails from the floors above), and somehow fitting new joists into position, and securing them sufficiently to be structurally sound, seemed like it could almost be more work. Old joists. Good call to remove them all. Also, the remaining joists would look awful compared to the new joists. Tearing out the floor and all the joists would probably be not too much more work, and the finished job would be so much nicer. The more new, the better. 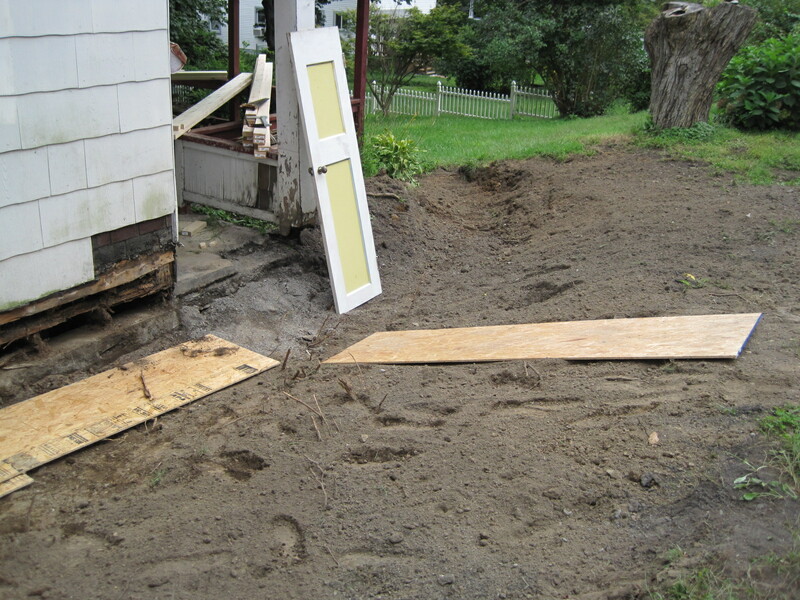 Several chainsaw blades, and a long day with a four-foot crowbar and sledgehammer later, the floor was out. Once the dust had settled and I could take a good look at things, I was horrified to see a lot of rot. Oh no. 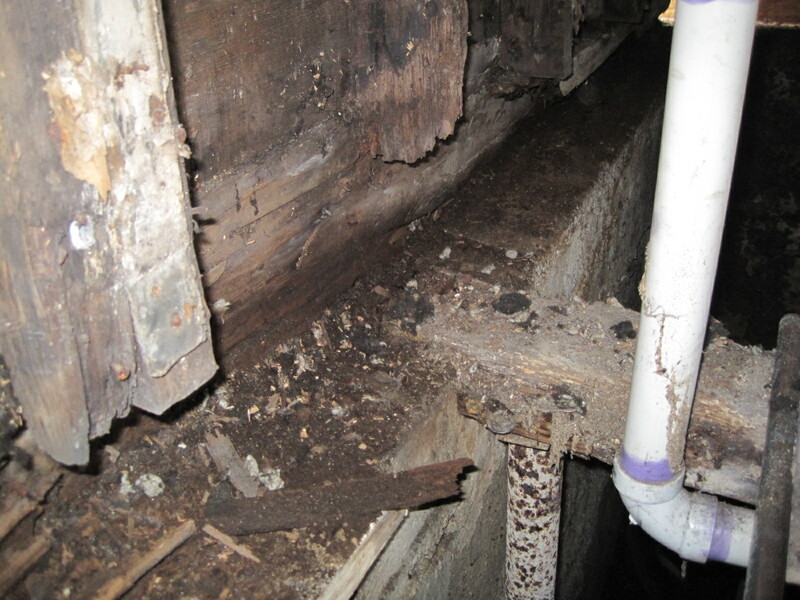 Upon further poking and inspection it was apparent that the sill plate and bottoms of the studs were completely rotten! Disaster! I couldn’t believe it. I knew the house needed work, but I did not expect any structural damage. I specifically hired a home inspector to make sure there was no structural damage and that the roof was basically sound. Extreme rot. Sill and stud bottoms completely gone. I would never have bought this house if the inspection had revealed structural damage. As you know, I agonized over the price, and the budget, to complete the job. I can’t afford this. Also, this project is supposed to be fun. A feasible job for a weekend warrior do-it-yourselfer. I do not have the expertise, equipment, or resources to tackle structural issues, let alone the mental fortitude. A setback of this magnitude required some regrouping. That evening I settled in for a few beers and a run through the five stages of grief. 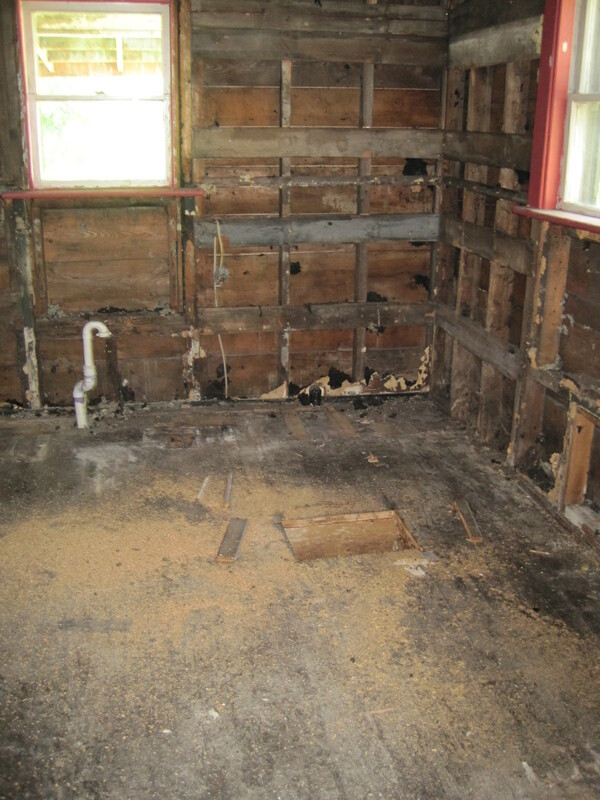 Denial (this can’t be happening, it’s not possible that the home inspector missed this rot and damage), and a beer. Anger (that $#@^%*! home inspector! Only a %^@# idiot (and me) could have missed it), and another beer. Bargaining (I’ll never drink again if this somehow miraculously goes away), and, incongruously, another beer. Depression (oh bother, it’s hopeless, I quit), and a couple more beers. Finally, I reached acceptance, and intoxication. It is what it is. Yes, it’s bad, and certainly a setback, but I’ll figure it out. 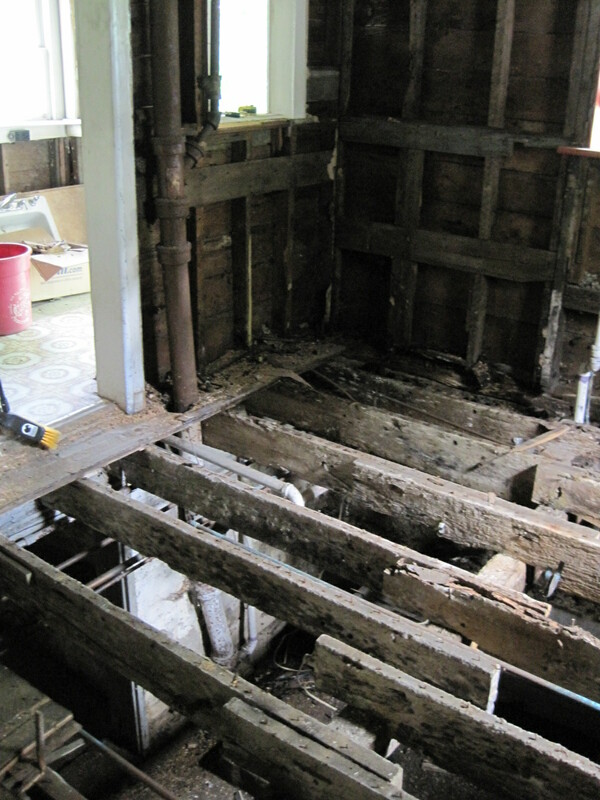 I will simply add ‘Repair rotten/collapsing rear of house’ to the ‘To Do’ list, and muddle onward. Chuck Silfee excavating exterior foundation of kitchen. I went back to the house and started clearing away the rotten wood to see what I was actually dealing with. Further poking around also made it apparent that the dirt on the outside of the foundation was higher than the foundation wall! I have never seen that as accepted practice in any home renovation book. 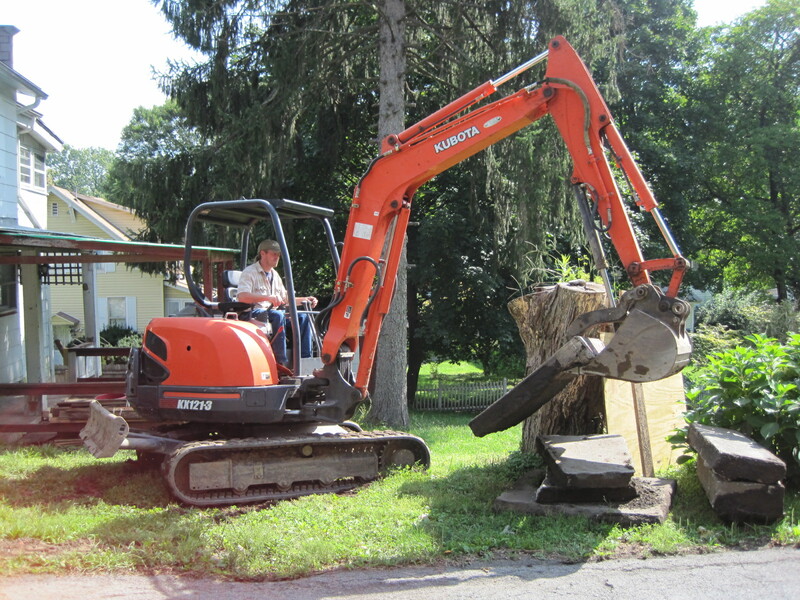 I called a contractor I know (who has a backhoe), so that we could dig the dirt away . This was getting worse by the day! As you can see, the entire perimeter of the exterior walls of the kitchen are completely rotted. A foot or more below grade, where it should have been. 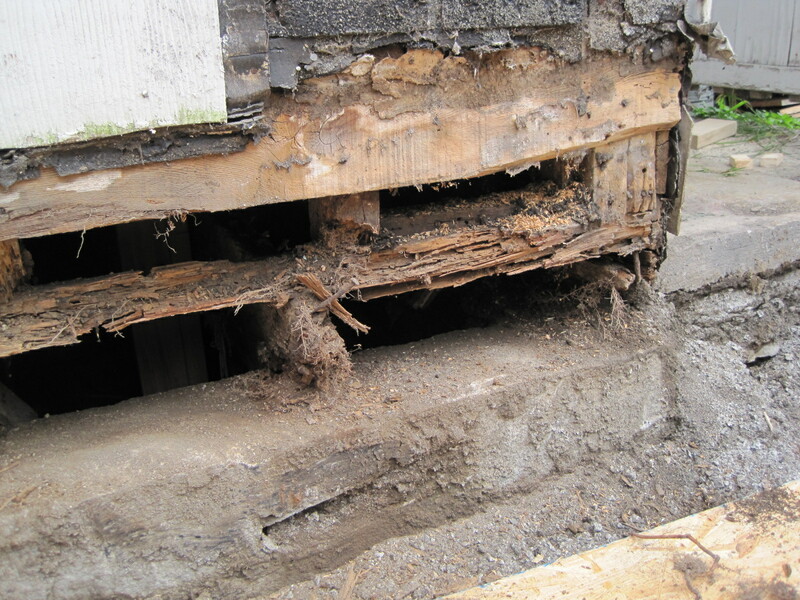 The sill plate and wall studs have rotted away. The only thing holding up the rear of the house is the siding! And the side of the house is somehow resting on … frankly, I’m not sure how or what it is resting on, or for that matter, why it is still standing. I took yet another unplanned trip to the lumber yard. What materials does one need to build columns from the basement floor to the kitchen ceiling? I bought nine 16 foot 2 x 4’s, which I lagged together to make three long (thin) columns. Prior experience - jacking up and rebuilding the rotten bottom of my garage wall. Although they look like toothpicks, hopefully they will keep this place standing while I plan the process of the next step. Coincidentally, and quite fortunately, last summer I found a similar problem in my garage. (I say fortunately because at least I know that this setback is, although a huge PIA, hopefully manageable). I jacked up the wall of my garage, cleared out all the debris, installed a new sill plate and studs, and lowered the garage back down. It seemed to work pretty well. However, that was a garage, not a two-story addition to a house, but I have to start somewhere. Some people seem surprised when I tell them that the house is not finished and rented. Even without this major problem, I guess some people have no idea how much I have actually bitten off that I can’t chew. I just laugh and comment that these things take time. Otherwise, if I had to actually explain it, I would probably break down crying on their lapels! It really isn’t that bad. Yes, it is a huge nightmare, and will cost me a lot more than I anticipated, but so it goes. One silver lining is that I have great grist for the blog! Leaving the necessities, for now. Could you remove 6 tons of material from your home? Well, as you know, the initial demolition of King Street was a mad frenzy of ripping and tearing over the course of 10 days. We managed to fill a 30 yard dumpster with just over 6 tons of debris! (see prior post – “Let the demolition begin.”). 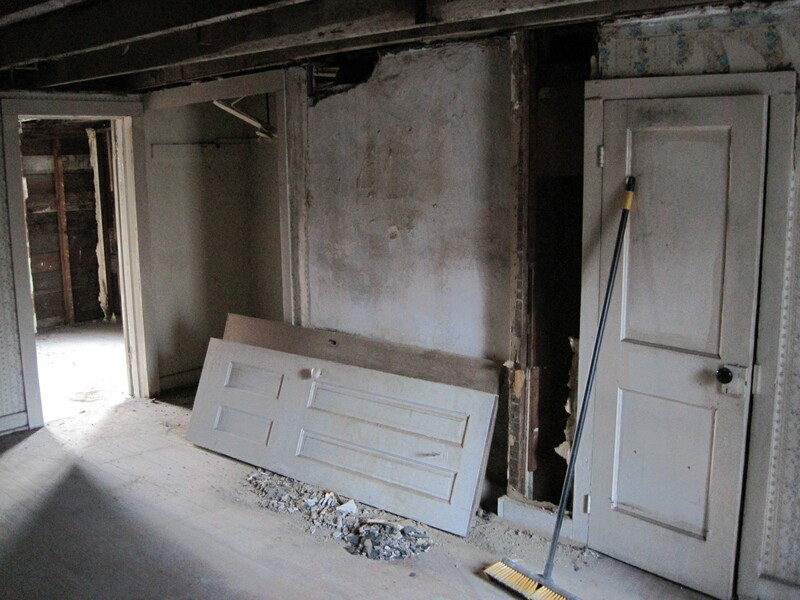 Initially, it was pretty easy to decide what to tear out – collapsing ceilings, paneling of assorted hideous colors, cracked plaster walls, old flooring, warped cabinets, and all the windows. was a huge dumpster available, the labor of my nephew, and the more old that is torn out would make room for more new. 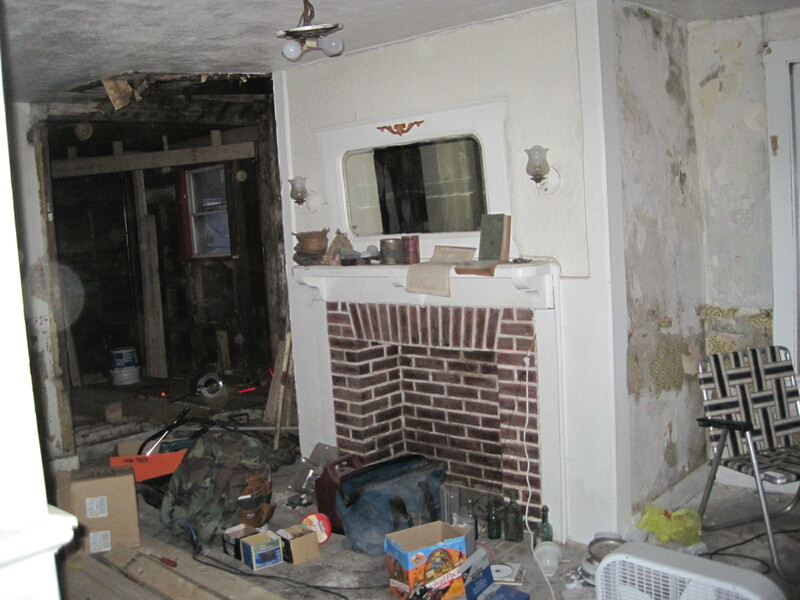 With a house this dilapidated, the more new, the better. So I erred on tearing out more than less, filling the dumpster, and worrying about the rebuild later. 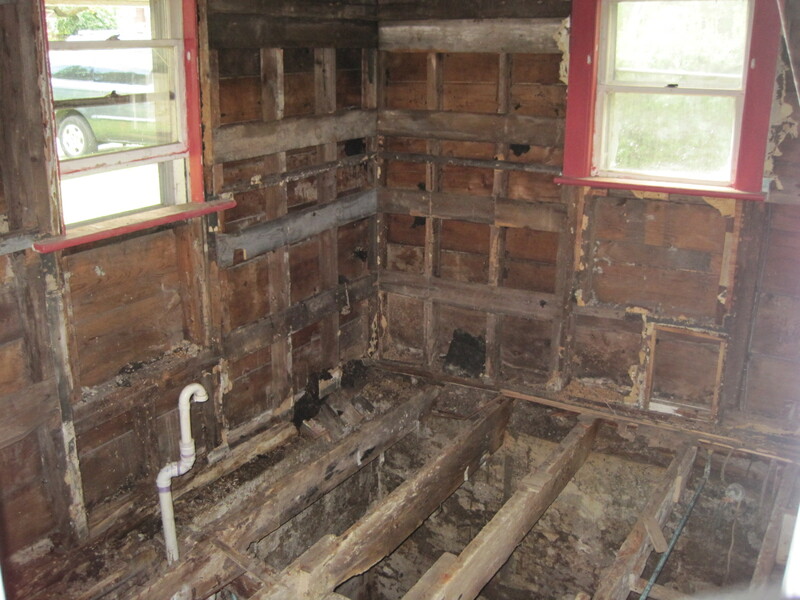 As such, out went the cast iron tub and tile enclosure, goodbye kitchen cabinets and counters, etc. If in doubt, it was torn out. Tearing out the lathe and plaster walls was another concern. 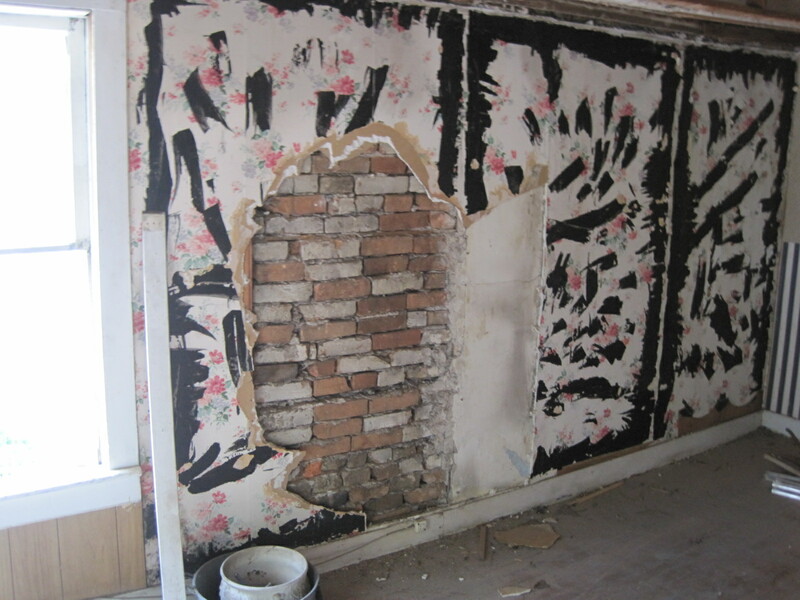 Not only is it unpleasant work, but tearing out all the walls would require an awful lot of sheetrock and spackle to replace, and spackling isn’t really in my skill set. One idea was to tear out all the exterior walls. This would allow for ease of electrical wiring, and much needed insulation. Oddly, there were no outlets on the exterior walls, and obviously lots were going to be needed. However, once we got the ceilings out and started on the walls, we came upon an interesting discovery. A hammer blow to the wall resulted in an unyeilding dull thud. This was not lathe and crumbly plaster. Amazingly, inside the exterior walls of this timber frame house, where one would usually find insulation (or a void needing it), they are instead filled with brick and stone! No wonder there are no electrical outlets! 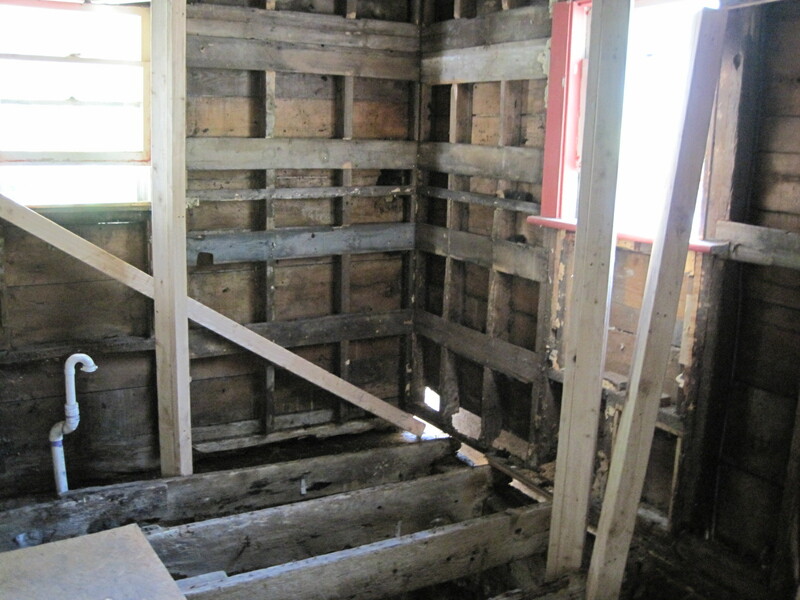 Further examination revealed that the house is ‘post and beam’ construction, like an old, very old, barn. This house is older than I thought. 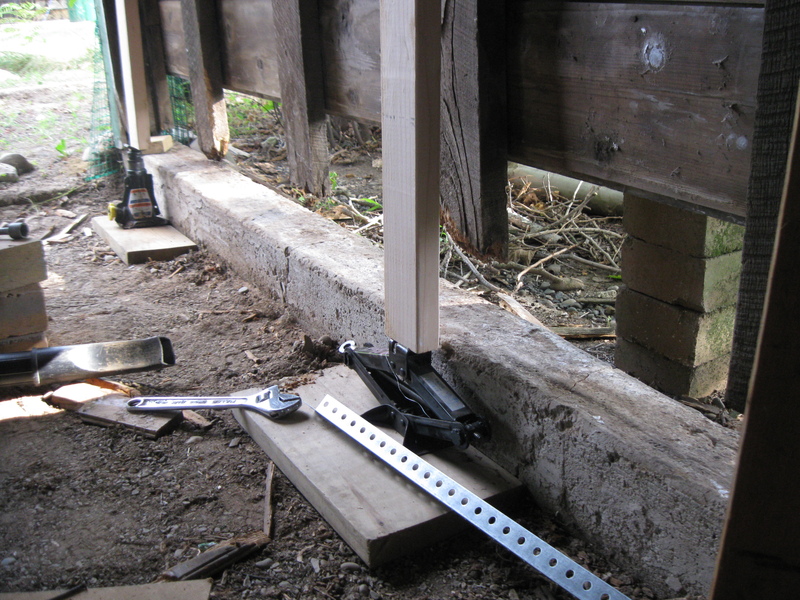 Post and beam construction, with stone for insulation. On the first floor the walls are filled with stone, and on the second floor, brick. Amazing. And why? A rudimentary insulation? To stop arrows from Indian raids penetrating? So much for electrical wiring and insulation! This will require some thought. The walls obviously stay. When the dust cleared, a partially gutted house, in all its (gory) glory, appeared. 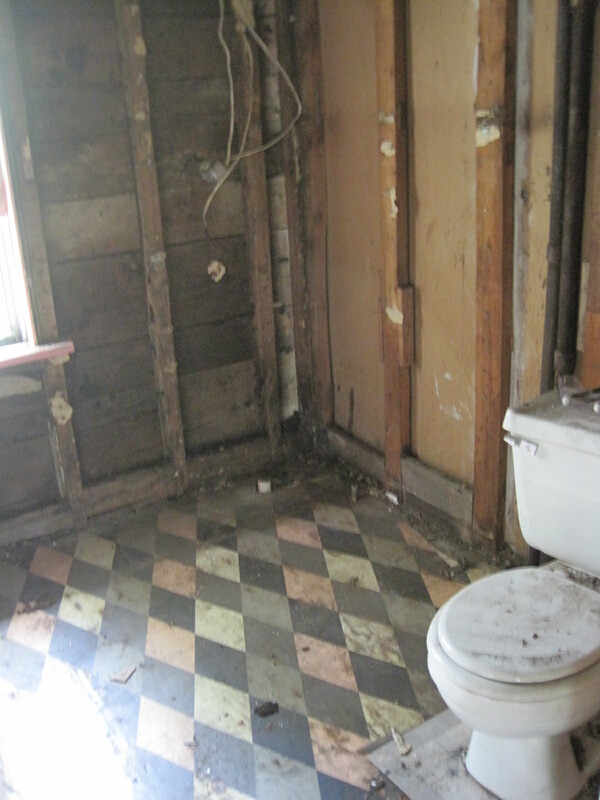 Oddly, after such great demolition work, the renovation project became more daunting! This house, after weeks of hard work, is probably worth LESS than when I bought it. Even more troubling, I now see there is even more demolition needed. The dumpster may be full and gone, but it certainly doesn’t mean the tearing out is over. 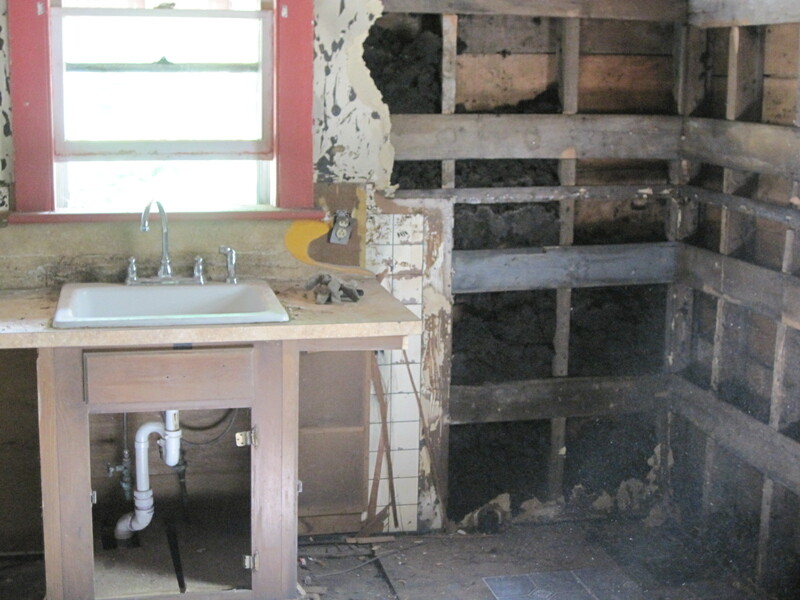 Tearing out walls, floors, cabinets, counters and fixtures has exposed more things that should probably be torn out. What is going to be difficult for me is that I want to do things right, and I don’t want to rashly leave behind something that may be ‘good enough’ or ‘okay for now.’ The time to clear out the old is now, which means digging deeper. However, this new round of demolition will have to proceed more slowly since it involves more structural aspects of the building. The new wave of demo started with the kitchen floor. I was told by the home inspector that a couple of the floor joists seemed to have prior insect damage. Here is an example of me not doing a quick fix, and instead doing it thoroughly while I am there. As opposed to replacing a couple of joists (which would leave the rest looking even older), I decided I should remove and replace the floor and all the joists. The rationale is that a prospective buyer will appreciate all new. After all, it is simply a matter of more labor, and a bit more lumber, right? Famous last words.